Although the Buitenplaats Park16Hoven in Rotterdam received an ‘excellent’ mark for its architecture, it was not chosen due to the land offer. The Park16Hoven estate at the northern border of the city continues this tradition with a 21st‑century twist. Instead of just one family, it has space for nearly 70 households. The apartment buildings (the main building, the wings and the restauration pavilion) are set informally within the English landscape park. Each of them in a timelessly modern architectural style and aimed at a sustainable future. 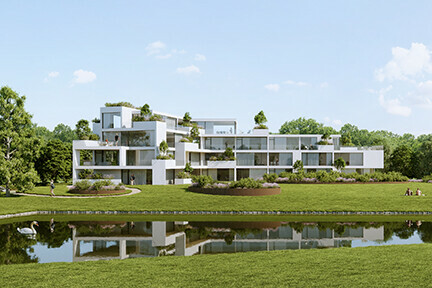 The white-plastered buildings were inspired by the villas in the Rotterdam museum park. Trees and shrubs adorn the terraces, thus deepening the symbiosis between nature and living. The core value of the design is a sustainable contribution to the city’s health, the inhabitants and the level of biodiversity of the area. Using large, freely organisable apartments, raised bungalows and family homes, we proposed a main building with two matching forest-edge villas. Besides the inclusive sustainability, this design is also about plush and comfortable living with grand views. The U-shape of the main building gives nearly all apartments a view to multiple sides. In this case, living in an estate can be seen as the superlative of living in a villa. ‘I was very happy to read in the assessment that we had amply satisfied the immense qualitative requirements. The municipality even assigned an “excellent” mark to the architectural aspect’, says Jeroen Simons, architect partner at Inbo. ‘And I am proud of it. If is a bit painful to realise we might have submitted the most beautiful design but were not chosen.’ Eventually, the land offer was the decisive point, and the project was awarded to a party that offered quite a bit more. Buitenplaats Park16Hoven was designed together with Van Wijnen.